A four-lane road, Gilman Drive in La Jolla near the Univ. of California San Diego (UCSD), recently had new sewer lines installed. A stretch of this newly-repaved road was mere weeks away from getting re-striped when BikeSD mobilized to have the speed limit reduced and buffered bike lanes added. BikeSD Executive Director Judi Tentor quickly assembled a Powerpoint and made a presentation to the University City Planning Group (UCPG) to show the many ways a road diet would improve the Gilman Drive corridor for all users. The Planning Group was enthusiastic about everything in Judi's presentation, though UCSD felt it could only contribute improved lane striping (in the form of buffered bike lanes rather than a full lane/parking removal as part of their sewer line replacement.) Still, it was the most suppportive community planning group reaction Judi ever attended. 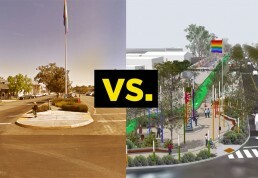 After the presentation at UCPG, BikeSD received tentative support for a change of striping from staff at UCSD. 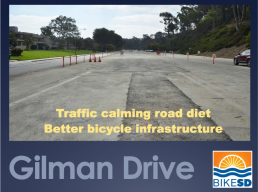 So BikeSD worked with San Diego city staff engineer Brian Genovese to get revised striping plans for Gilman Drive that include new buffered bike lanes. These drawings were completed in early December and sent to UCSD for use in the university's Gilman Drive re-striping coming later this month. BikeSD and all the UC area cyclists are hopeful about seeing this improved striping get used when UCSD closes up the sewer line project. What remains, however, is a full set of safety improvements for bikes and scooters along the Gilman Dr corridor. In principle, UCSD says it supports narrowing the lanes, reducing traffic speeds, and a fully protected bike facility along Gilman Drive. It will be interesting to see whether this will translate to future UCSD explicit calls for making the most of this corridor. 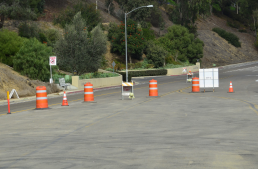 BikeSD looks forward to partnering with UCSD, the UCPG, and CalTrans in expanding safety and access for all users along the entire Gilman Dr. corridor. San Diego’s current Bike Master Plan creates an impossible north-south bike lane on 28th Street in North Park and South Park where a canyon and golf course make a bike lane here either impossible or expensive. Matt Stucky, founder of Right Side Club, says the City should study whether it’s feasible to add a bike lane on 30th Street between Juniper and Redwood when they repave the street after the pipeline replacement. The goal is to find a possible solution that allows for new bike with as little disruption as possible. BikeSD Executive Director Judi Tentor will be speaking at the University Community's Plan Update Subcommittee in an effort to get striping done in the Gilman Dr. Sewer Line Replacement segment to create an enhanced bicycle facility. Meeting starts at 6pm on November 13, 2018. Judi is on the agenda at 8pm. Location: Alexandria Building, 10300 Campus Pointe Dr., 2nd floor, La Jolla.